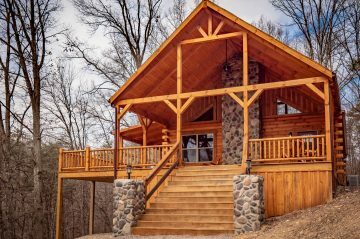 Surrounded by the natural beauty of the Hocking Hills, our newly built luxe lodges offer a retreat large enough for any family yet cozy enough for your romantic getaway. A respite from the stresses of home awaits you with custom built furniture and amenities sure to make your Hocking Hills stay memorable. Socialize on one the multiple porches and wrap around decks or melt your cares away in one of our eight-person hot tubs. Cook a gourmet meal in one of our fully equipped kitchens or grill out on the deck on the propane grill. Bring DVD’s to watch on one of the flat screen tv’s or watch your favorite show on satellite tv. Snuggle by one of the natural wood fireplaces or play ping pong, ring ‘em, poker, shuffle puck or one of the other custom built games in each lodge. Spend the evening around the fire pit gazing at the stars above. As expected in a Select Registry property, you will find attention to detail with quality linens and toiletries along with exquisite sheets and towels. 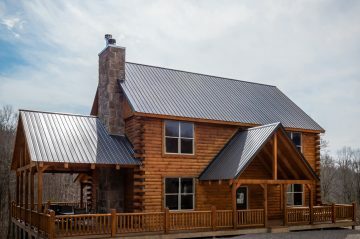 Your family will enjoy the 2 great rooms, 5 bedrooms and open loft of Patriot Lodge. Doubledown Lodge, featuring 3 tv’s, a poker table, shuffle puck, and a second refrigerator is perfect for a group of friends or your next Hocking Hills adventure.